Lets get creative Miami! Red Bull Fulltag makeshift airplane contest is coming to town. Start blue printing, get inspired and represent Miami with your crowd pleasing homemade glider. Event will take place November 3 at Bayfront park. Applications deadline is September 1. MIAMI – August 2, 2012 – What happens before and after takeoff is optional, but landing is mandatory. 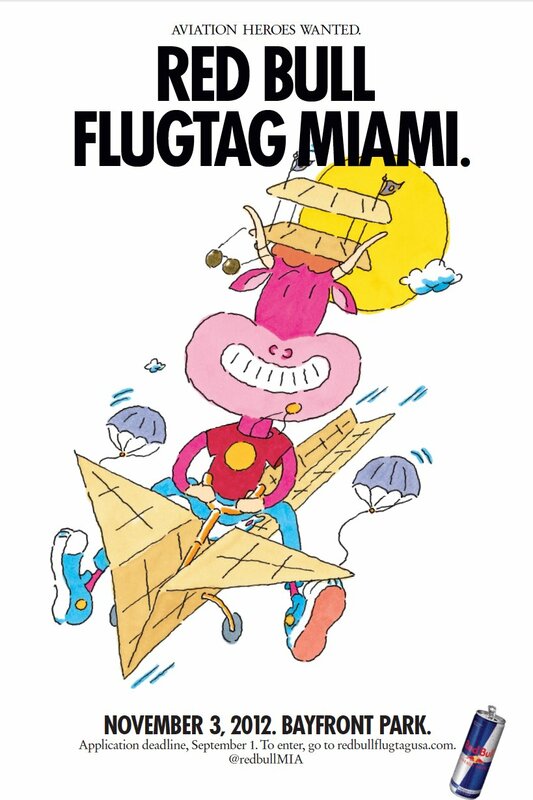 Red Bull Flugtag is soaring into Miami this fall for the first time since 2010, and applications are now being accepted from avid aviators throughout the Southeast. Bayfront Park will welcome thousands of South Florida residents and visitors to its beautiful waterfront to see the flights and follies of Red Bull Flugtag on Saturday, Nov. 3. Flugtag, German for “flying day,” is a competition that dares the brave and tests the brainy to design, build and pilot homemade aircrafts off a 30-foot high ramp in hopes of achieving human-powered flight. Forty teams will be chosen to test their “wiiings” and compete in the flying spectacle that awes millions around the world. Past applicants have created crafts representing everything the imagination can bring to life, from fairy tales and comic book characters to iPhones and cheeseburgers. Entry is now open through September 1, 2012, and applications can be submitted online at redbullflugtagusa.com or via snail-mail. Interested teams should draw up their blueprints of an imaginative craft and prepare to fly…at least for a few seconds. Entrants must compile a team of no more than five people – four flight crew members and one pilot – to create a unique flying contraption concept. While distance is important, creativity and showmanship are necessary to impress the judges. These criteria have inspired such outrageous crafts as a towering Pope-mobile, an airborne outhouse, gangsters, hotdogs and a replica of Santa and his flying sleigh. While the sky may be the limit on creativity, there are still a few flight regulations. All aircrafts must be entirely human-powered – no motors or stored energy such as slingshots or catapults – and cannot exceed 450 pounds (including the pilot). Remember that size does matter, and all crafts must be less than 30 feet wide. Since the first Red Bull Flugtag in Vienna, Austria, in 1991, more than 100 Flugtags have been held around the world, attracting up to 300,000 spectators for a single event. The record for the farthest flight-to-date in the United States currently stands at 207 feet and was set at Red Bull Flugtag Saint Paul in 2010 by team Major Trouble and the Dirty Dixies. The pressure is on for this year’s Red Bull Flugtag flyers to blow these records off the charts! The Red Bull Flugtag in Miami will be the third of four Flugtags held this year, with other competitions occurring in Chicago, Philadelphia and San Francisco. Red Bull Flugtag is free and open to the public. For more information, visit redbullflugtagusa.com. Select photos are attached, but for additional images and video from past Red Bull Flugtag events for editorial use, visit redbullcontentpool.com. Through the Red Bull network, hi-res video and still images are captured and made immediately available for editorial use for all media channels including television, film, print, mobile and digital. The content is centrally located in the Red Bull Content Pool for media partners at redbullcontentpool.com.